Having returned to the city after two weeks at the beach, the pace of life has increased dramatically. Instead of that enjoyably bracing early morning walk along the ocean beach, there is now a morning battle with ever-increasing traffic. Still I always look forward to a new year with plenty of new challenges. 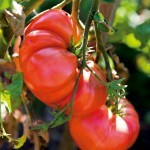 My garden offers plenty of climbing beans and carrots and cucumbers and dwindling supplies of fat tomatoes and zucchini. The eggplant and capsicum bushes are laden, the basil bushes are still luxuriant after all the rain, and my crop of pink fir potatoes has been harvested and I must say was a bit sparse. Whilst the warm and humid weather persists I have planted another crop of bush beans, more carrots and I broadcast mixed lettuce seed hoping to have a crop I can harvest with scissors whilst waiting for my self-seeded frilly lettuces to develop. The most dramatic garden news is that I returned to find my crabapple trees and my sole quince tree invaded by brilliant green and gold parrots. I frightened them off to quickly gather about three kilos of crabapples but as soon as I went inside they returned and the rest went in a matter of days. I was really angry about the quince crop as the fruit was nowhere near ripe. I made a small batch of crabapple jelly and included the two unripe quinces left hanging amongst the gnawed cores, and a branch of my rose-scented geranium. I have now bought an electronic bird scarer that supposedly deters the birds (and possums it is claimed) by emitting a high-pitched frequency signal. We shall see if it works. 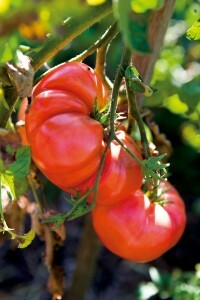 The Black Krim tomatoes were magnificent and I will save the seed to plant again next season. School is back and the team at the Stephanie Alexander Kitchen Garden Foundation are all hard at it developing new resources and activities and supporting our schools. We have welcomed seven more schools in Queensland this month and our total across the nation is now 266 schools. Training is very important and at our Learning Centre we offer sessions for kitchen and garden specialists and some for the general public. I am to give a demonstration of how to make fruit-based desserts that maximise the fruit element and minimise cream and butter so that our kitchen specialists can be newly inspired. Yesterday I poached some peaches and made a jelly with some of the diluted pink syrup, and will suggest that an exquisitely wobbly jelly surrounded by a delicious combination of diced seasonal stone fruit is perfectly possible for the students, and by omitting any sugar with the fruit is a healthier option than the fruit they may have encountered in cans. Cutting the fruit salad is good for the knife skills too.